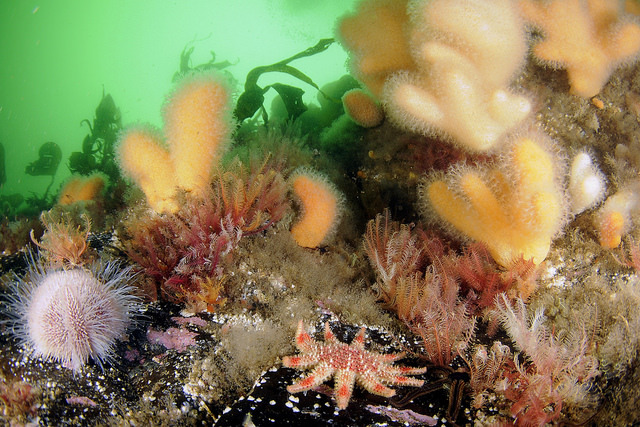 Scientists are preparing to make surveys of some of Scotland’s most unusual marine features. The sites include the Faroe-Shetland Sponge Belt, where sponges gather in aggregations nicknamed cheesy-bottoms due to their appearance. The Wyville-Thomson Ridge is a rocky plateau where beds of sea spiders and sea cucumbers are found. Another of the survey sites, Rosemary Bank Seamount, is a 1,000m (3,281ft) extinct volcano off the Western Isles. One of only three seamounts in Scottish waters seas, previous surveys estimated that it provided habitat to about 88 million sponges. All three sites are types of Marine Protected Areas. Scottish government directorate Marine Scotland Science and UK organisation Joint Nature Conservation Committee (JNCC) are involved in the surveys. The work will be done from the Aberdeen-based, Port Glasgow-built fisheries research ship, MRV Scotia. It can carry a crew of 17 and accommodate up to 12 scientists. The Faroe-Shetland Sponge Belt Nature Conservation Marine Protected Area lies west of the Shetland Islands and is a large rift basin that separates the Scottish and Faroese continental shelves. Five different water masses meet in the area, bringing nutrients that help deep-living cold water species to thrive, including sponges, worms and long-lived molluscs called ocean quahog. The aggregations of sponges were given the cheesy-bottoms nickname by the Faroese. The seabed in the area also has rocks deposited by ice bergs during the last Ice Age, and there is also an area containing what are called the Pilot Whale Diapirs, 70m (230ft) high mounds of sediment. Scientists say the mounds have sediment that could be 24 million years old. The surveys of the Faroe-Shetland Sponge Belt NCMPA, Rosemary Bank Seamount NCMPA and Wyville Thomson Ridge Special Area of Conservation are due to start on 21 August. JNCC said “much effort and work” had gone into securing the designations of the sites as nationally and internationally important protected areas. The next phase of this work is to understand how the condition of these areas changes over time and how they can continue to be managed effectively, the organisation said. Surveys are done periodically and involve taking measurements and videos and photographs. The latest survey will also involve grabbing samples of the seabed. This article was originally published as Study to delve into cheesy-bottoms sponge belt off Scotland at BBC News on 27/07/18.